Home Staging is the most important thing you can do before you sell your home! Although staging is optional, it really shouldn't be. When you're dealing with such a significant financial transaction, you don't want to be lazy and settle for a lower selling price or a longer marketing period than you have to. Relative to the amount of time and money involved, staging may be one of the most lucrative projects you ever undertake. Potential buyers aren't just looking for a structure to inhabit – they're looking to fulfill their dreams and improve their lifestyles. Staging helps sell those dreams and creates a more emotional purchase that can generate more money for the seller. While there are plenty of room-specific staging tips, if you're on a limited budget, it's best to focus on big-picture improvements and on the areas that will make the biggest difference in your home's selling price. There are two major problems with clutter. One is that it distracts buyers from your home's features. The other is that it makes it seem like the home doesn't have enough storage space. Put away knickknacks. Keep in mind that buyers will be interested in your closet space, so tossing everything into the closet to hide it away may not be the best strategy. SELL, DONATE or TRASH IT! If you haven’t used it, seen it or touched it for over a year get rid of it. Selling is easier than ever. Garage sales, CraigsList and Ebay work well. 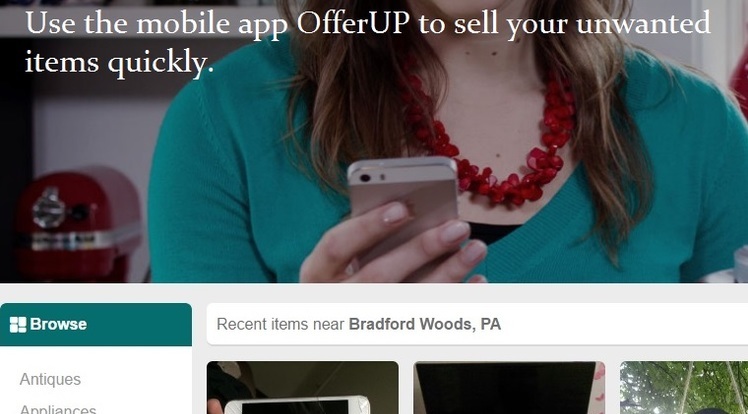 Use the app OfferUp to easily sell your stuff. We REALLY like a this mobile app because its its is FREE and EASY. It allows you to instantly put items up for sale and take bids right from your smart phone. Give it a try! In the kitchen, potential buyers love to see new appliances that come with the home, but if you can't do that, make the ones you have spotless. No one wants to see splattered spaghetti sauce, films of grease or piles of crumbs in their potential new home. Likewise, make sure your bathroom sparkles, from the corners of the tub to the sink drain to that spot behind the toilet you don't think anyone can see. Your goal should be to make everything look new. Buyers need to be able to envision themselves in your home, so remove all the family photos, items with family members' names on them and refrigerator art. Also make sure to put away all the toys and anything else that is highly indicative of the home's current inhabitants. Pets, kids, what you ate for dinner last night, a mildew-covered bathroom and many other conditions can make your home smell. You are probably immune to your home's smell, so you'll need to have a friend or neighbor help you out with this one. Inexpensive tricks for ridding a home of odors and giving it an inviting aroma include baking cinnamon-coated apples in the oven, burning vanilla-scented candles, or throwing some slice-and-bake cookies in the oven. It's also a good idea to grind half a lemon in the garbage disposal to remove sink odors. While you could use a spray to deodorize your home, it might give it a cheap, institutional bathroom smell, which is hardly the image you're going for. If you're a smoker and you normally smoke indoors, start limiting your smoking to outside the home and take extra steps to deodorize indoors. Finally, don't forget to take out the trash. Make sure each room has a single, defined purpose. Also make sure that every space within every room has a purpose so that buyers will see how to maximize the home's square footage. If you have a finished attic, make it an office. A finished basement can become an entertainment room, and a junk room can be transformed into a guest bedroom. Even if the buyer won't want to use the room for the same purpose, the important thing is for them to see that every inch of the home is usable space. This includes alcoves, window seats, corners, breakfast nooks and so on. It is unlikely that a potential buyer will like your wallpaper. Your best bet is to tear it down and paint the walls instead. Don't even think about painting over the wallpaper – it will look shabby and send red flags for the buyer about all the work he or she will have to do later. Custom paint colors are the same way. You may love your orange bathroom, but people's tastes in colors are very specific and highly personal. While you might think that white walls would be ideal because they create a blank slate that allows buyers to envision their own décor and gives them an easy starting point, it's actually better to paint your home with warm, neutral colors that appeal to the masses and project the homey image you're trying to sell. No one wants to live with dirty, stained carpet, especially when someone else made it that way. Linoleum is passé and looks cheap. Though pricey, hardwood floors add value and elegance to a home. They are also low-maintenance, provide great long-term value and are perfect for buyers with allergies. In other words, they appeal to almost everyone, and if not, they're easily carpeted over by the buyer and preserved for the next owner. In kitchens and bathrooms, go with ceramic tile or stone if you can afford it. If not, use high-quality vinyl tiles that mimic their more expensive counterparts. If you can't afford to do that, stick to common areas like the living room, dining room and kitchen. Bathrooms should make the cut too because they have relatively little floor area and therefore won't be too expensive to upgrade. Take advantage of your home's natural light. Open all curtains and blinds when showing your home. Add supplemental lighting where necessary. Outdated or broken light fixtures can be cheaply and easily replaced. If you think your existing fixtures are fine, make sure to dust them, clean off any grime and empty out the dead bugs. Make sure furniture is the right size for the room, and don't clutter a room with too much furniture. Furniture that's too big will make a room look small, while too little or too small furniture can make a space feel cold. Don't use cheap college furniture, either. You don't have to pay a lot of money to switch out your existing furniture and you may even be able to rent it, but the furniture should look nice, new, expensive and inviting. You'll also want to arrange the furniture in a way that makes each room feel spacious yet homey. In the living room, for example, seating should be set up in a way that creates a gathering area around the fireplace. Cracks in the walls or ceiling are a red flag to buyers as they may indicate foundation problems. If your home does have foundation problems, you will need to either fix them or alert potential buyers to the problem. That said, a fix would be better in terms of getting the home sold. If the foundation only looks bad, but has been deemed sound by an inspector, repair the cracks so you don't scare off buyers for no good reason. Your home's exterior will be the first impression buyers get and may even determine their interest in viewing the inside. Make sure your lawn, hedges, trees and other plants are well-maintained and neatly pruned and eliminate any weeds. To brighten windows, wash them well, and consider adding flower boxes to brighten them up further. If you can, power wash your home's exterior – it can make it look almost freshly painted but with less effort and expense. Make sure the sidewalk leading up to the house is clear and clean, and purchase new doormats for the front and back doors. If you have a pool, showcase it by making sure it's crystal clear. Creating some sort of outdoor living space in the backyard, such as a deck or patio with outdoor furniture, is another way to use the exterior of your home to its greatest advantage. Even if you have plenty of cash, don't put too much money into the staging process. You want to emphasize the home's best features, but keep in mind that what sells the home and what will make the home usable for the buyer are not necessarily the same thing. Overall, to get the most bang for your buck, your home staging efforts should be designed to appeal to the widest possible range of buyers. The more people willing to submit purchase offers for your home, the higher the selling price will be.